Day 2 of the trip brought an early rise, quick breakfast and right off the hop,phenomenal fishing. We started right where we left off and it was on fire! Chris brought out a 30 inch TV for the camera and powered it with a battery and generator. 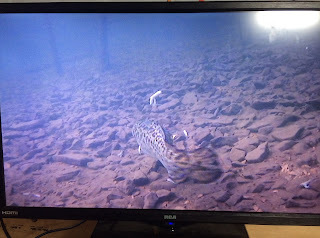 It made for some of the most exciting fishing ever! This allowed Jay to use my Marcum camera and boy were we set. 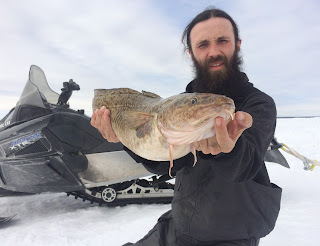 We were seeing tons of burbot and the occasional pike roaming through, when early on a big pike showed up on both our screens and without hesitation, smashed Jay's rattle bait. The fight was on and I reeled my line up quickly so as not to get tangled. After about 3 or 4 minutes of fight Chris exclaimed he was pretty sure it was mid 40's and after another 3 minutes of fight, we were absolutely positive it was. Alas, it wasn't meant to be and after one chance at landing it, she bit through the line and was gone. 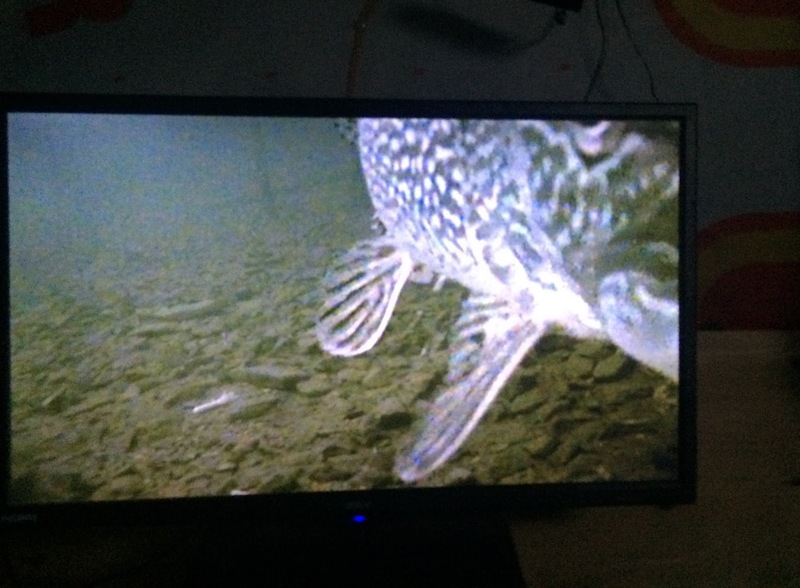 That's how it goes some times and when you are up at Cedar there is always a chance at a 40 plus inch pike. The camera and water clarity often allow for a good oportunity to judge the size of the fish when close to the lure. Coincidentally we had 4 more chances at excessively large pike through the day all resulting in bite offs. It was a heart wrenching reality. Pictured above is the second tube I lost on the bottom of the lake to the same trophy pike. Her and a friend hung out near by and beneath us for over 10 minutes. We wouldn't see anymore pike over 40 inches on the camera this trip but one member of the group did get on some nice ones in a back bay over the weekend. We pounded burbot with unbelievable action all day and as the evening approached a nasty white out storm rolled in. As the front of the storm flew over the permie, the wind picked up and the snow began. It was then that I hooked into and caught a nice burbot over 31 inches that made my day. Lucky for us I had our path back to camp plotted on my handheld GPS or we would have had to leave 30 minutes before the big girls came to play to avoid the storm. 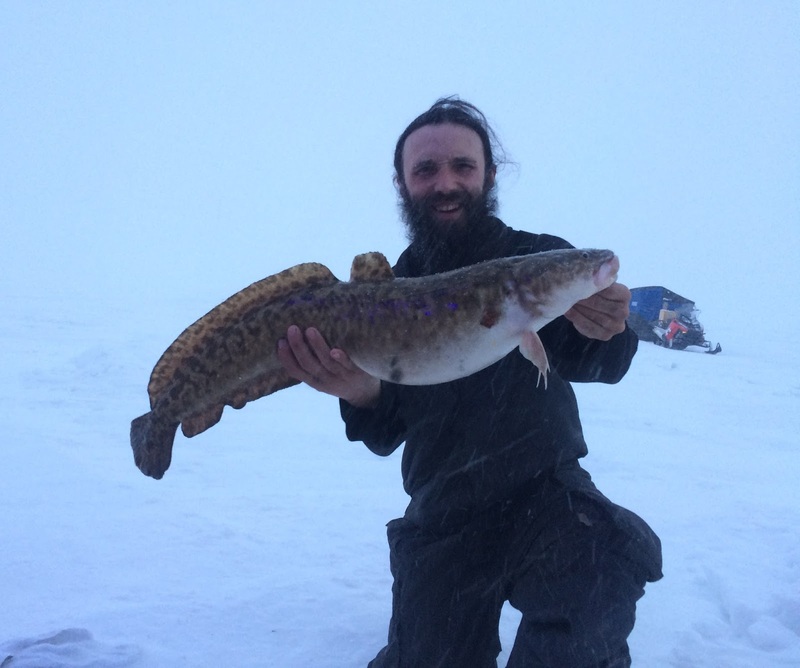 We again fished well into the night, catching and releasing plenty of burbot while keeping enough for a few meals. The ride back to camp was slow and steady through the winds and snow and by the end of the storm 7 cm of fresh snow had landed. 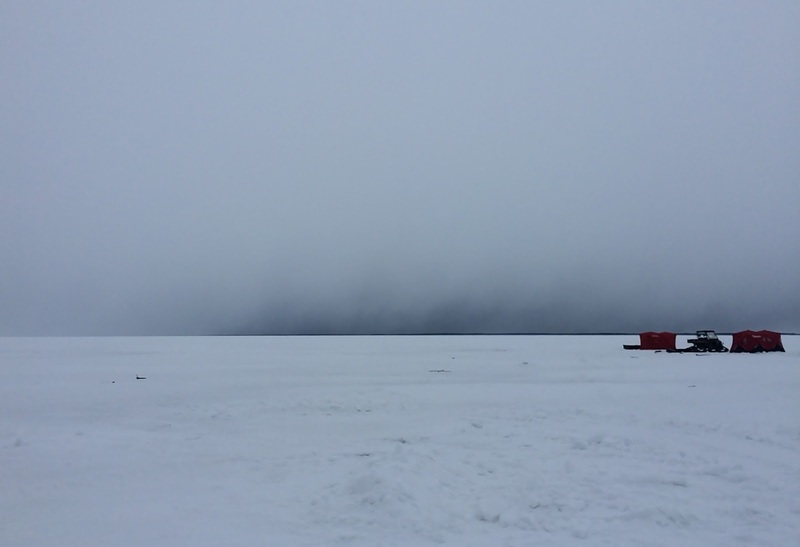 This would make for a treacherous stretch of drive for the rest of the group coming up the next day, but smooth travel on the lake for sleds.